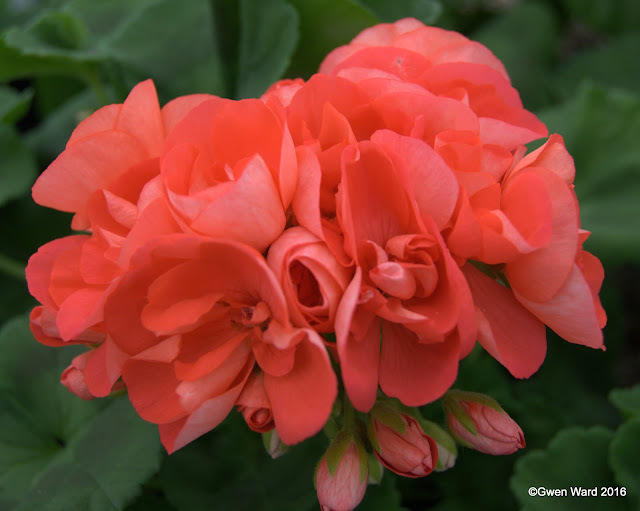 Bold Carnival, raised by John Gibbons, UK, is a basic zonal with dark peach double blooms. John Gibbons is a prolific UK hybridiser and uses the pre-fix 'Bold'. Fibrex Nurseries have a lot of his varieties in their catalogue. April has been a month when plants have been arriving through the post and personally delivered. . Earlier in the year I ordered from both Scented Geraniums of Northern Ireland and Fibrex Nurseries, Nr. Straford-upon-Avon. Both these nurseries plants arrived in the same week, both well packaged and are now growing well in the greenhouse. Before Liga’s surprise parcel arrived, I had a wonderful afternoon with Anne, a Swedish pelargonium enthusiast who was over here on a visit to stay with her cousin Marika, also Swedish but living here in the UK. Anne very kindly brought me two zonartics and a Stellar. These are Vilda Tilda, Lara Marjorie and Sune Tryg. Thank you so much Anne. It was a lovely afternoon chatting’pelargonium’, taking a few cuttings for her to take home. I will update you on all these new varieties. 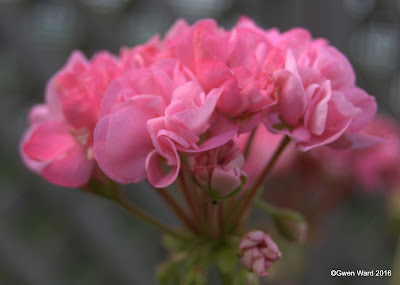 The Rosebud type zonal pelargonium “Sweet Jess” is a recent acquisition for me. Followers of my Blog will know that I have a penchant for buying pelargoniums with names that have some relevance for me. My second grand daughter is named Jessica – so of course, I had to have this one, apart from the fact it is really beautiful – as is our own Jessica. This dwarf zonal pelargonium, “Sweet Jess” was introduced in the UK by Hodgson in 1996. The rosebud type flowers are a delicate light rose pink and the leaves are a mid green with a brown blotch. As promised in my last blog here are some photo’s of the Coir plugs I recently bought on eBay. I am really pleased with these. As you will see in the last photograph, they are much smaller than the coir plugs I used previously. These were open top and bottom, just in a 'sleeve', so if the plugs dried out on a hot day, the coir tended to fall out. These new Jiffy plugs are folded at one end so the filling does not fall out. I have yet to find out if the sleeves rot away. Cuttings above are: P. fulgidum, P. "W.I. Celebration" and P."Redondo".